Cytopharynx with numerous folded membrane ribs subtended by five or so microtubules. These microtubules have arms that bind to other microtubules and to the membrane of the cytopharynx and to surrounding vesicles of various sizes. The vesicles are uncoated and free of ribosomes. 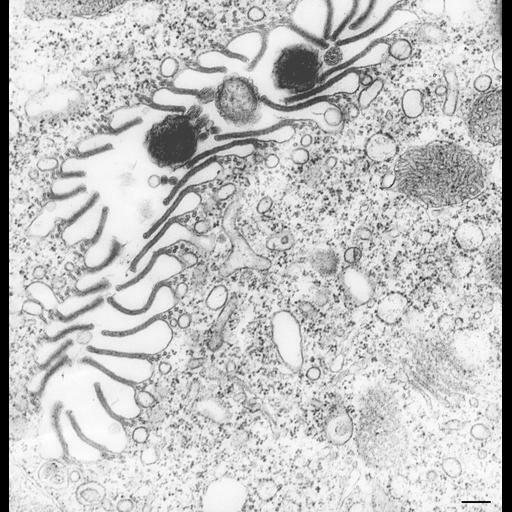 The vesicles are probably equivalent to the discoidal vesicles and/or to the 100nm vesicles; the latter arise from the endosomal pathway of Paramecium. Evidence for vesicle fusion to the cytopharynx membrane, between the ribs, can be seen. Bacteria and tips of cilia are present in the lumen of the cytopharynx. TEM taken on 4/6/72 by R. Allen with Hitachi HU11A operating at 75kV. Mag. 19,500X. Bar = 0.2µm. The negative was printed to paper and the image was scanned to Photoshop. This digitized image is available for qualitative analysis. There is a high resolution version of this image in the library (CIL:39460) which is available for quantitative analysis. Additional information available at (http://www5.pbrc.hawaii.edu/allen/).